Turning up a month early for your interview, spilling coffee over your future boss or forgetting the name of the company. The list of job interview gaffs are endless. 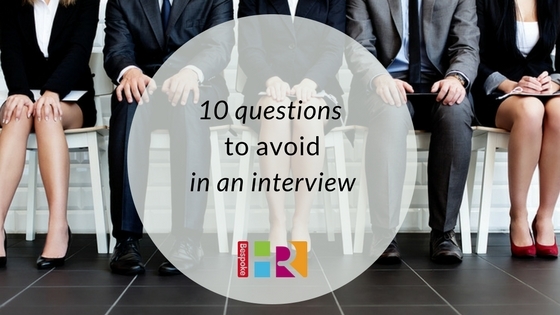 We know the key to most successful interviews are well-prepared and intelligent questions. So which questions should you avoid at all costs? How much does the job pay?What it says: you haven’t got past the first post and you’re only thinking about the money, not the company. What is the benefits package?What it says: you’re only interested in what you can get from the company, not the company itself. Do you do background checks?What it says: I’ve got something to hide. If you have, it’s far better to be upfront and honest from the start. How did I do?What it says: I’m arrogant and not afraid to put you, a future employer, on the spot. How soon could I be promoted?What it says: this role is beneath me. Do you monitor emails and internet use?What it says: I will be spending a large proportion of my time emailing my friends and checking Facebook. And the worst mistake of all, not asking any questions at all.What it says: I’m not interested in this job. It’s not all one-sided, and employers need to be just as mindful of the questions asked in an interview situation too. Are you married?What it says: we may discriminate between you and another candidate. Do you have children?What it says: we think you could be an unreliable employee. Are you from the UK?What it says: We may discriminate against you, depending on your ethnicity. Is English your first language?What it says: as above! How old are you?What it says: you’re too young / old to do this job. How many sickness days did you have in your previous job?What it says: we think you’re unreliable, and you haven’t even got the job yet.